Whats up OG Family! I'm getting spring fever and getting ready for outdoor season. Going organic and already have some soil mixed up and cooking. I plan to do a few photos and keep them small and a few autos this year. In order to stay compliant with the laws in my state I can grow outdoors as long as they are in a fully enclosed and locked location. I also want to be discrete as people don't need to know that I grow. So here's my plan so far, let me know what you all think. I have a corner of a fence that I keep bees in. they have not done so well and I think they could use some weather protection and I plan to combine the area for my plants as well as they have similar needs. Plus they are a pretty good security plan in themselves. In my years keeping bees not one person has had an interest to even get close to the hives to take a look at them! 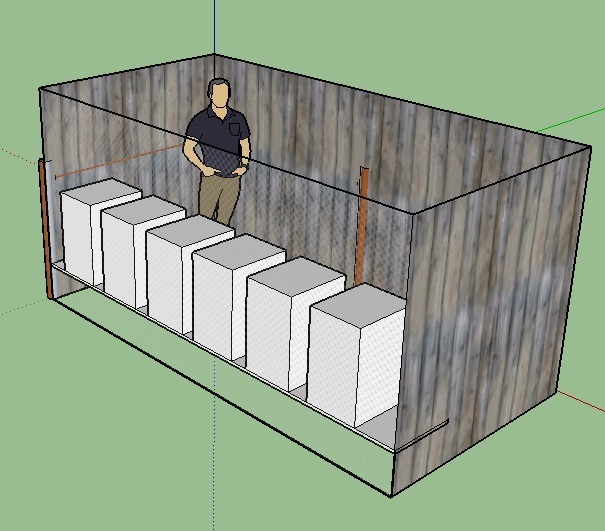 The plan is to construct a privacy fence on 3 sides with a door on one end. The south side will be open but fenced with the bee hives flush with the fence. That will give me around 8 ft x 14 ft behind them to grow. I am considering covering the top with either greenhouse panel or a light shade cloth. Here's what I'm picturing. I know the sides will shorten the days but I've used this technique before and think that it helps them to flower a little earlier before winter sets in. I'm curious to see this project as it progresses. Coincidentally my MMJ garden is on the other side of my neighbor's fence where he has hives. Swarms are bit intimidating & I usually put the dog inside. A top covering may interfere with the bees... and as far as vines & trellis privacy... there's a wait time for them to grow & be sure to get perennial evergreen plants or winter means no more privacy. I checked today and my remaining hives didn't make it thru the winter. I still think I'm going to proceed with my plan but the hives will be more of a disguise. I'll put up a few "danger bee hive" signs and it should still keep people away. I'll order more bee's next year and hopefully they will do better with some protection. And I won't have to get suited up to check on the plants this year. Probably go with a shade cloth on top. Hail is always a problem in my area. This will be my own topic for 2018 season and beyond will post pics from seedlings to harvest here and try to answer questions that may pop up from time to time! If you decided to enclose with trellises which isn't a terrible idea. The vining type of nasturtiums, morning glories, black eyed susan vines etc... (aka annuals) grow pretty damn fast and would probably be big enough by the time the plants are flowering. Plus, the bees will dig the flowers. Funny how all us outdoor folk jump immediately to something in the outdoor grow section! Love it!!!! Not enough outdoor posts on OG! That's a really impressive grow @Tinytuttle! I've often thought about an outdoor scrog and you rocked it! And those stems, huge! I'm new to all this organic stuff so all these Tee's and brews go way over my head. I'm sure it will all make sense to me someday. Thanks for the suggestion @Meesh. For my yard and the bees south is best. The cover is really just to protect from hail and to be in compliance of the "fully enclosed" rules. They will be the easiest thing you’ll ever do once ya get the concept down as far as SST( seed sprout tea ) you just germinate your selected seed till it sprouts a 1/4 inch tail throw it in a blender grind it ,into water and water away ! Compost teas I use compost, worm castings, molasses and iv recently been putting various things like kelp meal, fish emulsion and grass and let it bubble for like 2.5 days and water through a hose end sprayer my whole yard and plants get that treatment! Probably the least exciting photo on OG. I buried a water line to my secret garden spot today. I'm going to automate the irrigation I think. At least I won't have a garden hose running to the bee shelter, that would look a little strange. I'm thinking about putting down some weed barrier to so I don't have to fight with that as well. Good planning. I like it. Got the hydrant set up, the weed barrier down and some of the hives set up. I think I'm going to pick up a few bees this weekend to make it complete. You'd have to be one crazy mofo to rip this garden!